It’s been a busy offseason in the offices of the NBA, featuring wins for some teams and losses for others. This year’s draft class makes a worthy adversary for the cake draping of offseason blockbuster news, but some roster moves made were nothing less than jaw-dropping. Well then, shall we count down our 10 favourite, starting from the bottom? In 2013, Simmons paid $150 to try out for the D-League. 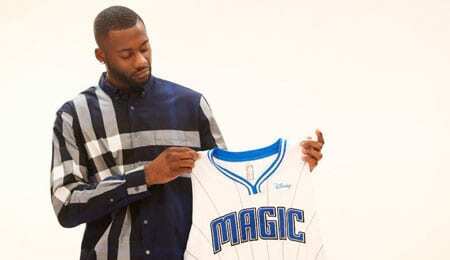 After being picked up by the San Antonio Spurs, he outplayed James Harden in a series-clinching game last season, put a Kawhi Leonard-less Spurs team on his back against the Golden State Warriors, and signed a $21 million contract with the Orlando Magic for the upcoming 2017-2018 season. Simmons is the embodiment of hustle and heart, and the Magic should be pleased about the defensive-minded addition of our No. 10 player. The only question is if Simmons gets in foul trouble, will Trae the Truth be there to save him again (see video below)? 9. Cory Joseph to the Indiana Pacers: A Toronto native who got the chance to play for his hometown team as the second-unit point guard/sixth man, Joseph is now heading to Indiana where he may be appointed the new starter. In exchange for Joseph, C.J. Miles headed to the Raptors. Keeping max-contracted Kyle Lowry and DeMar DeRozan forced management’s hand to clear up some cap space. Joseph, who stepped up adequately off the bench and in the absence of Lowry, was deserving of a contract renegotiation. Now, Joseph will get the chance to expand his game with a bigger role on the Pacers. 8. Zach Randolph to the Sacramento Kings: Randolph has more than claimed vet status and is still going strong. He was an instrumental part to a dark-horse Grizzlies team for years, and will try to fill the missing shoes of DeMarcus Cousins in Sacramento. Z-Bo now will be playing with a group of hungry youngsters like freshly drafted De’Aaron Fox, with an uncanny opportunity to help turn princes into Kings with all that he has left in the tank. 7. Dwight Howard to the Charlotte Hornets: The 2016-2017 season was set to be Howard’s homecoming, comeback year. In the end, all it amounted to was 26-minute games, unhappiness, and an early first-round playoff exit. Howard claimed that a call from the Hornets’ owner, the G.O.A.T himself — Michael Jordan — after being acquired motivated him to really make this season something special. Howard joins All-Star guard Kemba Walker, as they look to secure a spot in the quiet Eastern Conference. 6. Derrick Rose to the Cleveland Cavaliers: It appears the basketball Gods aren’t done with Rose just yet. After years of bouncing around from rumoured trade to rumoured trade (and not literally bouncing due to bad knees), and then a career-planned redemption in New York that never came to fruition, Rose has somehow inked a $2.1 million deal to play ball with LeBron James in Cleveland. The fate of Rose blooming to MVP status again seems doubtful because of his cursed health, but the world will be waiting to see what he will do assuming he keeps himself healthy. 5. Rudy Gay to the San Antonio Spurs: A lot of players are claiming that this season will be a comeback effort. Gay, who signed a two-year $17 million deal with the Spurs as an unrestricted free agent, is one of them. He hopes to revive his career alongside the all-around-ball-playing guru, Kawhi Leonard. 4. Gordon Hayward to the Boston Celtics: After nearly being persuaded by Pat Riley and the Heat to take his talents to South Beach, Hayward decided to ink a four-year $128 million deal with the Celtics, reuniting with his old Butler coach Brad Stevens. Hayward is coming off the best season of his career (averaging 21.9 points, 5.4 rebounds, 3.5 assists and 1.0 steals over 73 games), and looks to notch his second All-Star berth in his first campaign in Boston. 3. Jimmy Butler to the Minnesota Timberwolves: The basketball world was caught off guard when Butler was put up for sale; even Butler himself was surprised. He was supposedly the new face of the Bulls, and the man to hold down the fort in Chicago. Perhaps Butler’s biggest plague was the doubts of being able to execute in a leadership role. Personal redemption and a team rejuvenation awaits him in Minnesota, as he joins the likes of youngsters Andrew Wiggins and Karl-Anthony Towns after being traded for Kris Dunn, Zach LaVine and the seventh overall draft pick (PF Laurie Markkanen). 2. Paul George to the Oklahoma City Thunder: What makes this move so compelling (besides the fact that we’re talking about one of the most talented players in the game in George) is that he was basically handed by the Pacers to the Thunder for “scrubs.” Of course, we are simply quoting the media here so don’t shoot the messenger. These “scrubs” referred to include Victor Oladipo and Domantas Sabonis. George plans to give OKC his best season, and Coach Billy Donovan plans to have MVP Russell Westbrook share the spotlight with George. 1. Kyrie Irving to the Boston Celtics: It was a rocky situation before it became a good one for Irving. Doing the unthinkable, he expressed unhappiness in Cleveland, and a desire for more. Irving requested a trade from the front office, creating tension with and surprising King James. Cleveland’s starting point guard was eventually swapped for a very blind-sided Isaiah Thomas and Jae Crowder. However, the trade was stalled over concerns about Thomas’s hip injury. In the end, the deal also included two first-round draft picks from Boston in 2020, and Irving went on to escape LeBron’s shadow to write his own legacy. Now it’s your turn. Which moves in the 2017 NBA offseason blew you away the most and how did they affect your Fantasy strategy? Of course, the other dude that stands to benefit from Jackson being shipped out is Smith. Given that he’s got a long-term contract, Smith might be handed the keys to the offense in Detroit, but again — either way — he’s in line for a boost in PT. Even as the backup, he’s developed some nice chemistry and at times has done a better job than Jackson of running the Piston attack. Smith has put up double-digit scoring efforts in four of the last five games despite getting over 21 minutes of action just once. That’s efficiency, people. So imagine what he’d do with a consistent 25 to 30 minutes. Mills is mostly coming off the bench, so his minutes tend to fluctuate, but he’s recently been seeing enough action to put up Fantasy-worthy numbers, including Friday’s 19-point explosion that featured two treys and a steal. This diminutive Australian nearly led his country to its first ever basketball medal in the Olympics in the summer, ranking second in the tourney with 21.3 PPG, so you know he’s capable of carrying an offense when needed. Harris has now scored not only double-digits, but 15-plus over a five game stretch. He produced 21 points, three rebounds, three assists, two assists and a block in a loss against the Nets Friday.